InMotion Stores have you covered. Whether you need noise-canceling Bose headphones in Atlanta’s Hartsfield Jackson Airport or T-mobile Tourist SIM Cards at JFK, InMotion Stores have got your back. 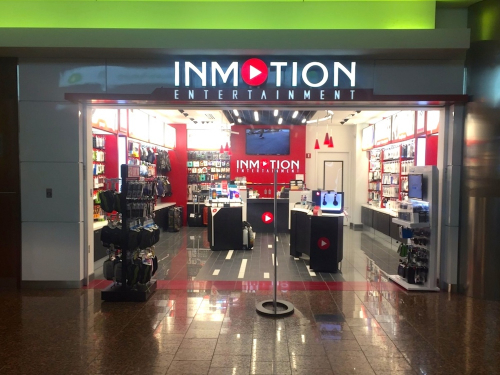 InMotion is the largest airport-based electronics retailer in the country with more than 120 locations across the US. InMotion partners with the hottest global brands to bring you a diverse selection of cutting-edge electronics. Here are just a few of the names you’ll find in our electronics stores. Apple has become one of the biggest names in technology - and with good reason. If you’re in the airport and looking for beautifully-designed products that perfectly accessorize your Apple products, InMotion Stores has you covered. As an Apple Authorized Reseller, you can find Apple brand cases, chargers, Earpods, cables, adapters, and more. Keep your iPhone, iPad, or iMac fully charged and sounding great. While Bose does boast an impressive collection of home theater and multi-room speakers, they’ve also figured out how to provide the same superior performance in a portable package as well. At InMotion stores across U.S Airports, you can find Bose earphones, over-ear earphones, noise-cancelling headphones, wireless headphones, and sport headphones to ensure that, no matter where you go, you’re always close to the music you love. Visiting from outside the United States? Stop by an InMotion store in any of our airport locations for a T-Mobile traveler SIM card. T-Mobile Sim Cards are a great option for your unlocked mobile phone. With unlimited text and data and 1,000 minutes of talk time, InMotion Stores and T-Mobile will keep you connected while you travel. Nobody knows more about what it takes to make music sound its best than musicians like Dr. Dre. No matter how you like to listen-- with wireless speakers, noise-cancelling headphones, or even just classic earphones-- there’s a Beats product for you. Make your next trip sound incredible and look stylish. Luxurious. Innovative. Intuitive. Whether you’re looking for headphones and speakers or electronics cases and covers, B&O Play products offer nothing short of the best. GoPro revolutionized the way we remember our adventures with their collection of sleek and durable digital video cameras. InMotion Stores help you take advantage of these simple, powerful little devices to capture what the world looks like from your point of view. Whether you’re a business professional, an athlete, or simply an audiophile, JBL provides an array of unique listening solutions that are sure to please. These days Samsung is doing a little bit of everything. From phones and tablets to wearable technology and virtual reality, we’re proud to bring you the best of what Samsung has to offer. A familiar name in households across the country, Sony is a trusted provider of everything from portable gaming equipment to headphones. If you’re looking for the latest Sony products, look no further than InMotion electronics stores.